At Rogue Regency, we love being part of a vibrant community that values fun. 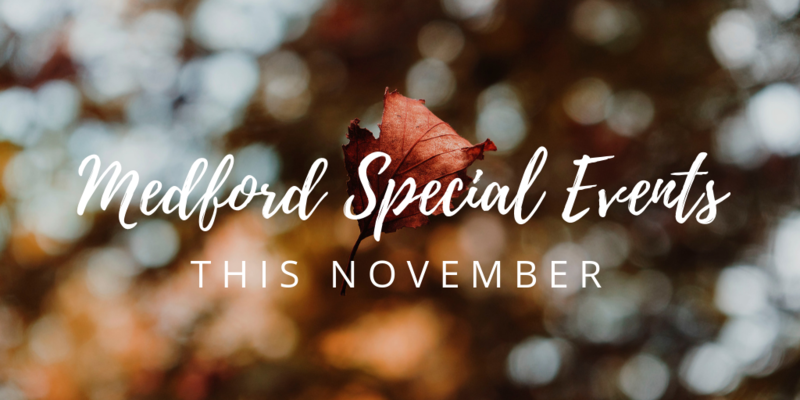 We invite you to discover the events in our area this November and enjoy Medford like a true local. Whether you’re traveling for the Thanksgiving holiday or simply visiting beautiful Southern Oregon, there are so many ways to enjoy the Medford area. Below we’ve compiled three delightful events that we’re excited for this November. We hope you’ll join us! If supporting the arts is your passion, then we invite you to participate in this event. Begin your jubilee on the 16th by attending a gala where you can expect to enjoy food, wine and lively auction. Follow your delightful and philanthropic night with a tour of fantastical gingerbread houses on display the 17th through the 19th. Your support will give the theater opportunity to bring performing artists to the city of Medford all year long. Southern Oregon has so much to offer in the way of culinary delights. The four day culinary festival puts our most talented chefs in the area to the test. Using produce from the area, chefs battle it out in the ultimate competition to be crowned the winner. Spend your days sampling not only food but also the exquisite wines and beer crafted right here in Oregon. Nothing could be finer. Schmidt Family Vineyards is one of our favorite places to enjoy wine tours and Friday night live music. You might say we have a soft spot for family owned businesses. You can enjoy delicious pizzas, sandwiches and cheese platters. Best of all? It’s open to all ages, that way, you can bring your whole family. These are just a few special events featured in November. The Southern Oregon area is teeming with activities and events to make the best vacation. Guided fishing, hiking and biking in the beautiful outdoors are among our most favored activities. However you decide to enjoy Medford and the surrounding areas, we invite you to stay with us at Rogue Regency for that home away from home feeling. For more information, give us a call at 541.770.1234 or email us at regency@rogueregency.com. We also invite you to connect with us on Facebook.